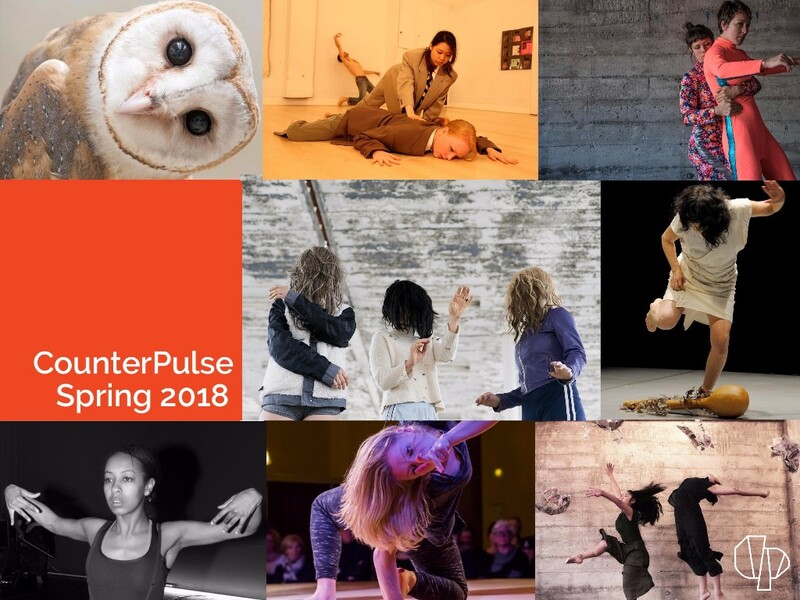 CounterPulse is launching into a mind-bending spring season with a series of performances that activate cultural pluralism through human-scale movements and bodily resistance. In spring 2018 we navigate through interplanetary time as lovers and cultural vanguards. Kicking things off in February, the legendary Kei Takei returns to San Francisco for a rare three nights of iconic performances that connect earth and tribe. Next, James Graham Dance Theatre will tantalize the stage with Dance Lovers 7: Duets by Couples, Crushes, and Comrades before Wax Poets investigate—through movement—a body weathered by the deluge of “emergency.” Then, we turn to community artist practitioners for the third annual Blessed Unrest: Arts and Social Justice Festival with Crescent Moon Theater Productions. In March we’ll flex into our first edition, four-day CounterPulse Festival in partnership with SFMOMA and The Stud Collective, which will serve as a platform for experimental dance and performance-making, conversation, and radical celebration. The season progresses with Simpson/Stulberg Collaboration and Five Feet Dance exploring ancestry, ephemerality and permanence in our Edge Residency, before CRAIN/LACHMAN/POLIAK finds geologic mutuality between apocalypses and utopias in SWIMMING POOL. Next, multimedia artists Evan Johnson and Teddy Hulsker create a chilling sci-fi ghost story exploring loss, queer cosmologies and the power of belief in BARN OWL and Tim Rubel Human Shakes and Elisabeth Kindler-Abali investigates what it means to be an outsider in ALIEN. In spring 2018, CounterPulse steers into strange, new places as the flagship venue for radical arts and social transformation. It’s going to be a fun ride. Join us. The legendary Kei Takei is returning to San Francisco with her company for a rare three nights of performances. The company will perform one of the most recent pieces from Kei’s epic Light series, Bamboo Forest, followed by one of her iconic solo pieces, Run. These pieces are prime selections from Kei’s long history of creating emotionally charged work that resonates with the struggles and elation of being human, and the connection each of us has to earth and tribe. The evening offers an array of different artists, different couples from a Mother/Son, to newlyweds, Brothers, and best friends. Dance Lovers duets contemporary dance, hip hop and vogue, contact improvisation, dance, theatre, and more. Curated and produced by James Graham Dance Theatre. This year’s annual Blessed Unrest festival explores the question, “How can we make a positive, tangible change in our own communities while continuing to stand up for a world we believe in?” In honor, this day long festival will include 16 local non-profits presenting about their work and how individuals can get involved, alongside powerful Bay Area artists showcasing art that boldly advocates for social justice. The body when performative is resistance. Myriad classifications of the body exist and each can be radicalized. Swivel:Hinge:Return will investigate through movement a body weathered by the deluge of “emergency” and “breaking development” news stories that at best galvanize unified action and more complicatedly feed the cycle of “couch protests” in our social media era. The first edition of the CounterPulse Festival is both incubator and launchpad for experimental dance and performance makers. This year CounterPulse asks audiences to join in the experiment of festival, both human-scale and mind bending. Expect the perceptions and conceptions of yourself and those around you to flex as a full program of performance, conversation, and radical celebration unfold over four days. A highlight of the CounterPulse Festival is an artist lab that brings together artists from the Bay Area, swing states, and Russia to research how interdisciplinary arts can be a model for cultural pluralism. CounterPulse’s Edge is an incubation residency and commissioning program for contemporary choreographers whose work is deeply curious about the intersection of art practice and social change. This year’s resident artists include Five Feet Dance presenting (de)classified, a multidisciplinary performance of ancestry, culture, and change radically created in collaboration with Asian American women. Joining the bill is Simpson/Stulberg Collaborations for their premiere of Still Life No. 8. The eighth work in the Still Life series, the work explores ideas of ephemerality and permanence, stillness and action, featuring an original set, music and costume design. Tickets are priced at a sliding scale of $20-$35 and Friday nights are pay-what-you-can, reservable online. Let’s celebrate our radically wonderful community again! This gathering is an offering to you, our treasured community of creative, freaky artists and arts advocates. Join us at the Family Feast & Fundraiser and help us raise the funds that springboards our artist. You’ll be able to support the fund during the event by buying drinks, pledging, and shopping at the silent auction. At the dawn of the cyber age, 39 members of the UFO death cult Heaven’s Gate “exited” their human vehicles [bodies], transitioning, they believed, into androgynous Star Beings and leaving behind a trail of breadcrumbs on the World Wide Web. Evan Johnson (Pansy, Don’t Feel: The Death of Dahmer) teams up with Teddy Hulsker (performer/multi-media artist) to create a chilling sci-fi ghost story exploring loss, queer cosmologies and the power of belief. Have you ever felt strange, displaced and unwelcome? Did you experience a bodily reaction? ALIEN investigates what it means to be an outsider, a visitor, a newcomer to an environment that fears and questions your presence.